I was feeling like a lazy decorator the other day... I wanted to start my holiday decorating but I only had a few minutes to put something together before the little one woke from her nap. I was looking for instant gratification, something quick and easy. This is what I came up with. I pulled out a few things from my Christmas decor stash and sort of just piled it all together... the brown ornaments and cone trees are from Ikea two years ago, the white pinecones are Crate & Barrel, crystal bits from Pottery Barn, and the reindeer and penguins are from Loblaws/Superstore. 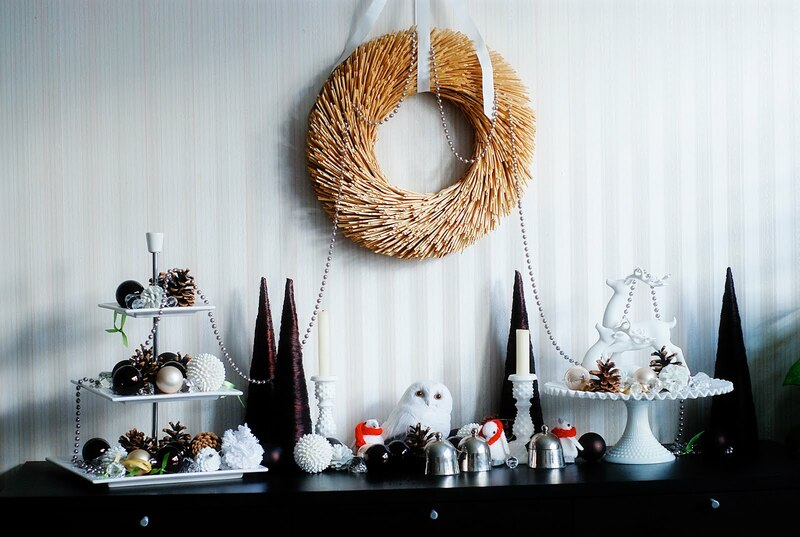 The reed wreath is Ikea too. I was feeling a sort of natural organic look mixed with a bit of holiday glam so I stuck to a palette of browns and whites. I used my 3-tier stand (also from Loblaws) and hobnail candlestick holders and cake stand to add some height and texture. I love all the different textures, shapes and finishes. Polished off the look with a white ribbon for the wreath and a latte coloured pearl strand. Easy peasy pretty. OMG! I'm obsessed. I was going for something like that with my sideboard but it somehow needs to be more full the way yours is. I need more STUFF! I love it! So fun and festive; great palette, too! I love all of your displays! Gina - I have the opposite problem. Way too much stuff...its hard deciding what gets to come out for Christmas and what stays in the dusty box for next year. Lovely Little Nest - The cake stand is a vintage find from an antique fair. I sometimes see these come up on eBay so you should try there. Wendy - the owl was from the William Ashley sale (on now!) last year. Love, love, LOVE everything you did here!! Love the colour palette. Very modern. I have the same 3-tier stand from Loblaws. Thanks for the decor idea. I love it! 2010 is definitely my favourite. The color palette is very calming. 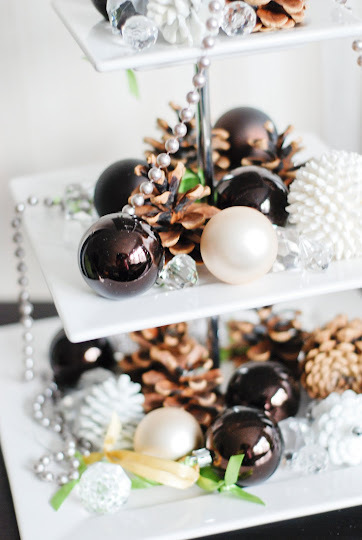 Love what you did with the ornament balls on the cake stand. Beautiful! I agree, 2010 is my favorite too. This is such a pretty display! I miss naps! So lovely. Love the contrast of the delicate and the natural. Impressive! And to think you put this together during nap time... well done! WOW it looks beautiful, good job! As usual, it looks right out of the magazines. I love the wreath! it looks gorgeous girly! you never cease to amaze me! Nice work! And you did it so quickly. I think you might be magic. So pretty and so unique! 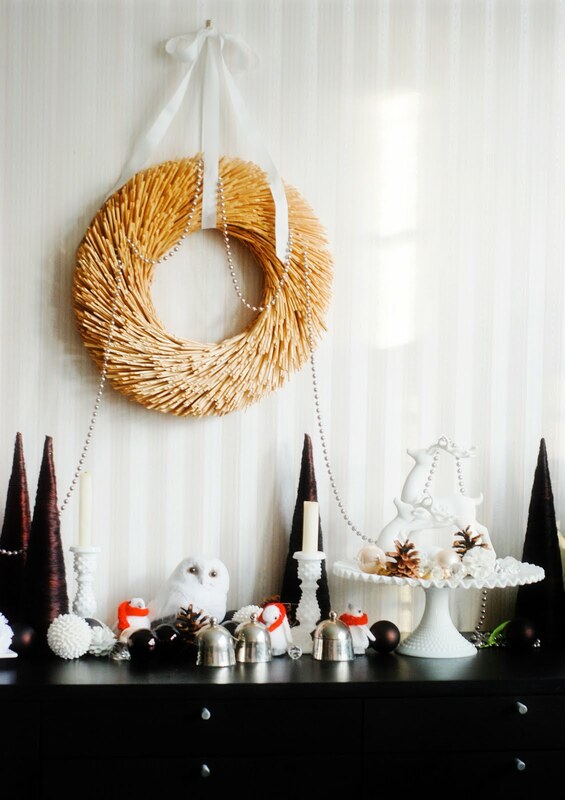 Is the wreath from Ikea? Looks great. I need to go rummage in our basement for our ornaments. We went out West last year so it's been awhile since I've seen them! Still trying to figure out how I've been missing out on your blog for all this time! Love all your years, but especially love the tiered stand with the holiday fillings. Beautiful! How beautiful it all is! I just love the approach you took with Christmas. And your house is just gorgeous! I remember your office space from RMS. You & your hubby are very talented! Love the brown and white. And I love that wreath!! Stopping by from the vignette party! :) I love the color palette you chose. It is gorgeous. Are those silver bells? Where did you find them... they are adorable! I would love to find something similar. Beautiful wreath. I love everything about it. The colors, the clean lines! Looks so great! 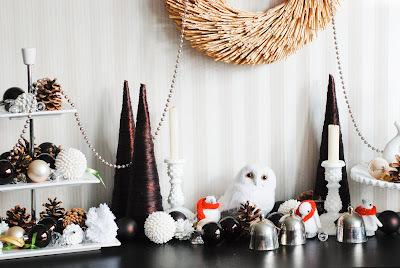 I love the white and brown color combo you are using and I am totally jealous of the cake plate and owl. It looks stunning!